The Chief Minister, Mr Om Prakash Chautala, today set development as his agenda for the forthcoming Assembly poll. Chief Minister Om Prakash Chautala addresses a rally in Bhiwani on Sunday. — A Tribune photograph. Failing to formulate a broader policy on allotment of party ticket for the coming Assembly elections, the State Election Committee of the Haryana Pradesh Congress Committee last night submitted a list of nearly 300 candidates to the screening committee of the All-India Congress Committee. The BJP formally kickstarted its election campaign in Haryana by organising a rally which was addressed by its president and former Deputy Prime Minister L.K. Advani here today. This was the first-ever rally addressed by a national leader of any party after the declaration of the poll schedule. With the Assembly elections in the state fast approaching, both the ruling INLD and its arch rival, the Congress, are positioning themselves for larger share of support from the farming community. The BJP central leadership is understood to have reconciled to the stand of the Haryana unit of the party not to align with the ruling INLD in the state and contest all Assembly seats alone. The state unit of the Shiromani Akali Dal (Badal) has sought 15 seats from its alliance partner, the Indian National Lok Dal, during the forthcoming Assembly elections in Haryana. The president of the Haryana unit of the National Congress Party, Mr Ved Pal, said today that his party would field its candidates in all 90 Assembly segments if the Haryana Congress did not forge an alliance with the NCP in the coming Assembly elections. With one month left for the electorate to press the button of electronic voting machines, the Congress nominee, Capt Ajay Singh Yadav, Rashtriya Navchetna candidate Vijay Somany, and the prospective BJP nominee, Mr Randhir Singh Kapriwas have plunged into electioneering on a feverish scale in Rewari constituency. Kaithal: A direct Kaithal-Delhi train service has remained a distant dream for the people of this area for the past four decades. Expressing his disgust at the Congress-led UPA government, Samajwadi Party supremo and Uttar Pradesh Chief Minister Mulayam Singh Yadav said today that he was confident of forming the third front at the Centre ‘’despite the hesitation of the Left at this juncture’’ in this regard. Senior Congress leader and former Haryana minister Chhattarpal Singh showed his strength at a general body meeting of Ghirai Chalisa, a body comprising representatives of 40 villages under the Ghirai Assembly segment, here today. The “arbitrary” attitude of the ruling INLD government has messed up the education scenario in the state, particularly in the home district of the Chief Minister, Mr Om Prakash Chautala, says the Congress, promising to bring back education within the reach of the common man. The leaders of the District Congress Committee (urban) and the Block Congress Committee, Ambala, have decided to send their resignations to the party high command if the ticket from the Ambala City constituency was allotted to any outsider. The electoral rolls for all 90 Assembly constituencies in Haryana , which are under special summary revision from January 1, will finally be published tomorrow. While the central leadership and representatives of the Haryana unit of the Bharatiya Janata Party Kisan Morcha are in favour of construction of Sutlej Yamuna Link canal at the earliest, its Punjab unit differs from their stand. The Rai police today registered a case of dowry harassment against a youth, Jatinder, and four other members of his family, including his father and mother, on the complaint lodged by Jatinder’s wife, Anuj, who alleged that they tried to kill her by giving her poison. The local MLA, Mr Chander Mohan, today informally launched his election campaign by participating in public meetings and listening to the problems being faced by residents. The Chief Minister, Mr Om Prakash Chautala, today set development as his agenda for the forthcoming Assembly poll. Addressing a nav sankalp rally organised by the INLD to launch its campaign, he said he had set a record by fulfilling promises he had made to the people before the last Assembly poll. However, his task was still unfinished and he wanted people to give him another term to complete the development process. The Chief Minister said when he assumed office, Haryana was more or less like Bihar with no roads, power and an army of unemployed youths. During the past over five years, more than 22000 km of roads had been repaired and new roads laid. About 3,000 villages had been provided with drinking water facility and Rs 2278 crore had been spent on strengthening the canal network. He claimed that during Mr Bhajan Lal’s tenure from 1991 to 1996, Haryana produced only 118 MW of power whereas this figure for the past five years was 1479 MW. A thermal power plant was also being erected. Its first unit with a capacity of 300 MW would be functional by 2006 and the second unit would take two more years to start generation. Mr Chautala said though the people had voted against his party in the May Lok Sabha elections, the performance of the Manmohan Singh-led government had provided them with the opportunity to weigh the merits of his government. The Congress at the Centre had failed to arrest inflation. The Centre was gradually withdrawing subsidies on essential items which directly affected the farming community and the labour class. This was evidence of the pro-rich inclination of the Congress. He said the Congress had at least a dozen leaders in the race for the office of the Chief Minister. They were themselves “begging for ticket and such persons could never deliver the goods to the people as they would always be at the mercy of Mrs Sonia Gandhi. He called upon party workers to fan out to villages and create awareness. He said no ticket aspirant should come to him with his supporters as he would pick the best among the lot. He said who ever he chose would be the right choice for the people of that Assembly segment. The rally was largely attended. Traffic remained disrupted for several hours before and after the rally. The police had a tough time clearing the roads. Mr Ajay Singh Chautala, Mr Sultan Singh, Mr Tarlochan Singh, Mr Sampat Singh and Mr Ashok Arora were among those who addressed the rally. Failing to formulate a broader policy on allotment of party ticket for the coming Assembly elections, the State Election Committee (SEC) of the Haryana Pradesh Congress Committee (HPCC) last night submitted a list of nearly 300 candidates to the screening committee of the All-India Congress Committee. Though normally a maximum of three names are recommended for each constituency, in some cases SEC has recommended five names to the screening committee. Further, the committee could not arrive at a consensus over fielding of sitting MLAs. Instead of restricting its recommendation to the sitting MLA, it has in some cases recommended other names also. After screening committee scans the list, the final list would be cleared by the Congress President, Mrs Sonia Gandhi. Though there were speculations that there was a complete unanimity over the names of candidates for 17 of the 90 seats, members of SEC refute such reports, saying that even for the Kalka Assembly seat, there are other candidates besides Mr Chander Mohan, a son of the HPCC chief, Mr Bhajan Lal. Sources point out that the name of former Haryana Minister, Mr Lachman Singh, also figures for the Kalka seat. Mrs Usha Sharma, a confidant of Mr Bhajan Lal, denied that she was an aspirant for the Kalka seat. Interestingly, the name of former Union Minister of State for Civil Aviation and former president of the Chandigarh Territorial Congress Committee, Mr Venod Sharma, also appears in the final list submitted by SEC. Mr Venod Sharma may contest from any seat in Ambala or Karnal district. While SEC faced an uphill task in making its recommendations because of the massive response for applications to contest the coming elections, differences over names of even senior party workers and leaders surfaced during deliberations. It is not only the Congress which is facing problems in finalising the list of its candidates, other parties, too, are indecisive about their candidates. The ruling Indian National Lok Dal (INLD) is trying to bring in new faces. Though the names of a couple of senior bureaucrats were being mentioned as possible candidates, there was no official corroboration of such reports. Haryana has been known for sending bureaucrats, both to Parliament and State Assembly in the past. One senior bureaucrat in the Chief Minister’s Secretariat, who is due for superannuation in four months time, sources indicate, has been offered the INLD ticket. He, however, was yet to make up his mind. In the last Lok Sabha elections, wife of the Director-General of Police, Dr M.S. Malik, was made the INLD candidate from Panipat. Mr Kirpa Ram Punia, Mr I.D. Swamy and Mr Bahadur Singh are examples of bureaucrats turning politicians in the state. Mr Advani did not much criticise either the UPA or the INLD governments, other national and state leaders of the BJP did not mince their words to flay both governments. Mr Advani said his party was concentrating more on those states where it had not come to power even once. The BJP had already brought a change in national politics where only a single party was coming to power time and again, he said, adding that now the scenario had changed and no one could ignore the BJP. Similarly, the BJP wanted to bring same changes in state politics, he said. Urging voters of Haryana to provide his party a chance to rule in the state, he said people of Haryana had tried every political party except the BJP. Mr Advani said the BJP was ruling in six states where it had provided a clean and corruption free rule. Talking about the Shankaracharya’s arrest, he said his party was against the way he had been arrested and kept in an ordinary jail. He said allegations could be levelled against anyone but the Shankaracharya’s status should have been kept in mind before his arrest. He expressed concern over the suicide by farmers in a large number during the UPA rule. He claimed that the BJP and the RSS were doing a commendable job in the rescue and relief work for tsunami victims. Appealing to the public to vote for the BJP, the in charge of the state unit Mr Shivraj Chauhan, said this was the first time that the BJP had decided to contest the elections in Haryana on its own. Criticising the Chautala government for doing nothing for farmers, BJP national vice-president and Sonepat MP Kisan Singh Sangwan said each anti-Congress government came to power in Haryana with the support of the BJP. Former Union minister ID Swami, state BJP president Ganeshi Lal and its former state chief Ram Bilas Sharma also spoke. While the ruling INLD is trying to drive home the point that it still retains its hold on the farming community through its public meeting in Bhiwani today-from where it kicked off its campaign for the Assembly elections. The senior most Congress MP from Haryana and former president of the state Congress, Mr Bhupinder Singh Hooda, will be addressing a public meeting organised under the banner of “Kissan Mazdoor Janhit Manch” in Rohtak. Incidentally, both the venues fall in the Jat heartland-which has traditionally acted as the fulcrum of major political movements in the state. According to many, the political moves and utterances of the INLD and its leaders suggest that the ruling party is concerned about the expanding base of the Congress in its stronghold of farming community and what Communists call “proletariat” segments of the polity. President of the INLD, Mr Shamsher Singh Badshani, cautioned his workers that Mr Hooda would canvass among the masses on ground that he hails from the farming community. The INLD traditionally draws its main succour from the farming community. Late Chaudhary Devil Lal, former Deputy Prime Minister and patriarch of the INLD and its earlier versions, was a kind of totemic figure among the farmers, landless farm workers and major sections of the socio-economic groupings. The INLD is fine-tuning its strategy to bring together its traditional support base for the coming Assembly elections as it would go to the poll for the first time sans the overwhelming presence of Mr Devi Lal. Significance is being attached to the public meeting to be addressed by Mr Bhupinder Singh Hooda tomorrow as many feel that the coming elections would be essentially a trial of strength between the INLD and the Congress for share of support from the farming community as this section will act as the core group for the two parties for forming the next government in the state. It is not without reason that Mr Hooda will be organising the public meeting tomorrow under the banner of Kissan Mazdoor Janhit Manch-a socio-economic organisation which swears to effect a change of guard in the state. According to BJP insiders, BJP President L.K. 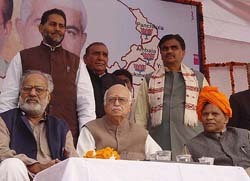 Advani is firmly on the side of the Haryana unit of the party, especially in view of the bitterness between the two parties during and after the last electoral venture in the state. The state leadership is said to be in touch with Mr L.K. Advani. The reason for this is said to be reports of former Punjab Chief Minister and President of the Shiromani Akali Dal (SAD) trying to convince top leaders of the BJP, including former Prime Minister Atal Bihari Vajpayee, for an electoral alliance between the two parties. A BJP stalwart from Haryana, Mr Sitaram Singla, summed up the mood of the state unit of his party a few days ago when he asked as to why Mr Badal had kept a silence when Chief Minister Om Prakash Chautala had tried to demolish the base of the BJP as an organisation and also fabricated criminal cases against its leaders. The BJP’s central parliamentary board, which is scheduled to meet on January 4, is tipped to clear names for at least 27 Assembly segments. The party, as a matter of strategy, will clear the names for all 90 segments in three batches. While the first batch of names will be cleared on January 4, the second will be by January 9. Although the BJP has taken an in-house decision not to field possible Congress or INLD rebels, the leaders are credited with the view that there will be many disgruntled elements in the Congress camp who can play spoilsport for the Congress on being denied ticket. The BJP’s assessment is that there will be several rebels in the Congress and it will be wise to adopt a “wait and watch” policy. The names which have been almost finalised by the BJP are thus: Mahendergarh-Ram Bilas Sharma; Ateli-Kailash Sharma; Faridabad-Chander Bhatia; Mewla Maharajpur-Krishan Pal Gujjar; Mundhal-Om Prakash Maan; Narnaud-Ram Kumar Gautam; Nangal- Paviter Singh Bajwa; Hassangarh- Naresh Malik; Panipat- Sanjay Bhatia; Meham- Meena Chaudhary; Pai- Narsingh Dhada; Pehwa- Balbir Singh Saini; Uchaana-Om Prakash Nain; Barwala- Jeetender Singh Jog; Jatusana-Rao Narbir Singh; Rewari- Randhir Singh Kapdiwas; Bawal-Jaswat Singh Bawal;Yamunanagar-Ghanshyam Daas; Kalka-Gyan Chand Gupta; Hansi-P.K. Chaudhary; Jhajhar-Mahesh Kumar; Tohana-Subash Barwala; Dadri- Ved Pal Sangwan; Gurgaon-Sitaram Singla; Taoru- Sanjay Singh; Beri-Santosh Gochi and; Ambala City- Veena Chibbar. Some of the seats where the choice has narrowed down to two are — Rohtak-Pradeep Jain and Manish Kumar; Sonepat- Devi Das and Lalit Batra; Karnal- Shashi Pal Mehta and Santosh Atreja; Salawas-Lakhman Yadav and Mahavir Sihag and Kalanaur-Sarita Narayana and Ram Avtar. The state unit of the Shiromani Akali Dal (Badal) has sought 15 seats from its alliance partner, the Indian National Lok Dal (INLD), during the forthcoming Assembly elections in Haryana. A decision to this effect was taken at a meeting of the state election committee of SAD, held under the chairmanship of Mr Joginder Singh Aherwan, at Gurudwara Nadda Sahib today. The seven-member election committee of the party demanded that their (SAD) candidates be fielded from Punjabi-speaking and Sikh-dominated Assembly segments in Ambala, Kaithal, Jagadhari, Dabwali and Kurukshetra. Mr Joginder Singh Aherwan, working president of SAD, Haryana, said that the final decision in this regard would be taken by SAD President, Mr Parkash Singh Badal. "We are joining hands with the INLD, in order to give a tough fight to the Congress in forthcoming Assembly elections. The Congress has always been an opponent of Punjab and Punjabiyat. They were the ones who covertly supported the anti- Sikh riots in 1984, and ordered for plundering of the Golden Temple during Operation Blue Star," he alleged. "On the other hand, the INLD has given due importance to the Punjabi settlers from Pakistan in Haryana; former Deputy Prime Minister, Mr Devi Lal was a leader of the farmers and introduced the old age pension. The present INLD is carrying forward the ideals of Mr Devi Lal for development, and thus we have decided to support them. In case, we find a strong Independent candidate against the Congress candidate in any constituency, we will support him," said Mr Joginder Singh. He also appealed to the state unit of the BJP to soften his stand against the INLD, and work together for defeating the Congress. Talking about the long-standing rift within the state unit of SAD, and the floating of a separate wing of Akali Dal by former state President of the party, Mr Sukhdev Singh, Mr Joginder Singh said that the former had no following in the state. Among others present on the occasion were Mr Mohar Singh, Vice-President, SAD, Mr Balkaur Singh, former member of the SGPC, Mr Raghujit Singh Virk, President of the Youth Akali Dal and Executive Member of the SGPC, Mr Sukhbir Singh Mandi, district President, Kaithal, Surjit Singh Nidar, general secretary of state SAD, and Bibi Kulbir Kaur. The president of the Haryana unit of the National Congress Party (NCP), Mr Ved Pal, said today that his party would field its candidates in all 90 Assembly segments if the Haryana Congress did not forge an alliance with the NCP in the coming Assembly elections. Talking to mediapersons here today, he said that a few months back the NCP had supported the Congress candidates in the Lok Sabha elections and at that time the in charge of the Haryana Congress, Mr R.K. Dhawan, while praising the contribution of the NCP, had assured the NCP leaders that they would be given their due share of seats in the Assembly elections. Criticising the Haryana Congress, he said that its leaders were not taking any initiative to take the NCP into confidence in this regard. He said that the NCP had demanded 20 seats from the Congress in Haryana and the national leaders of his party including Union Minister Praful Patel, had been raising this issue with the Congress high command. Mr Ved Pal said that there was no Congress wave in the state as claimed by the Congress leaders. He said that infact the people were against the Chautala government, which was benefiting the Congress. If the Congress did not make an alliance with the NCP, it would lose the chance of coming to power, he added. Around 12 HVP workers including Mohit Walia and Inder Mohan Pabbi, announced to join the NCP. The senior leaders of the party, including Shiv Hari Om, Satish Landa and Mohinder Singh Mahla, were also present on this occasion. With one month left for the electorate to press the button of electronic voting machines, the Congress nominee, Capt Ajay Singh Yadav, Rashtriya Navchetna (RNC) candidate Vijay Somany, and the prospective BJP nominee, Mr Randhir Singh Kapriwas have plunged into electioneering on a feverish scale in Rewari constituency. The Samajwadi party, INLD, BSP and others are likely to take a few days more to announce their candidates. The officiating chief of the Haryana Congress legislature party, Capt Ajay Singh Yadav, who won four times in 1989, 1991, 1996 and 2000 from here, has now entered the poll fray for the fifth time. He has already covered 100 odd villages of the constituency. Besides he also did door-to-door canvassing in some localities. Mr Vijay Somany, who lost to Capt Ajay Singh Yadav by a narrow margin in the February 2000 Assembly elections, has so far addressed well-attended election meetings in about 80 villages as well as several localities of Rewari city. He has made his intentions clear that this time he would be giving a tougher challenge to the Congress. As regards the BJP, Mr Kapriwas, who is engaged in hectic electioneering, has already covered the villages as well as the city areas. He has received enthusiastic response from the people. The impending entry of several other candidates of the INLD, SP, and BSP is expected to make the contest multi-cornered. Kaithal: A direct Kaithal-Delhi train service has remained a distant dream for the people of this area for the past four decades. A number of representations sent by trade and business associations, local Municipal Council, social and voluntary organisations, the District Bar Association, the Citizens Welfare Council and others to the successive Prime Ministers, Railway Ministers and senior officials of the Railway Board have failed to draw their attention to this long-pending and reasonable demand. The residents of this historic district headquarters town are unhappy with their elected representatives who have failed to keep their promises of providing a direct rail link between Kaithal and Delhi. Though this demand is about 40 years old and successive Chief Ministers of Haryana, MPs and MLAs elected from this area over the past decades made promises to get this demand fulfilled. The people lament that late Mr Gulzari Lal Nanda, who remained officiating Prime Minister and Railway Minister; Mr Raghbir Singh, Mr Tara Singh, Mr O.P. Jindal, Mr Harpal Singh and Ms Kailash Saini, who were elected members of the Lok Sabha from this area never put up a strong case for a direct rail in spite of the promises made by them. During the last Assembly elections and after taking over as Chief Minister, Mr Om Prakash Chautala, too, repeatedly promised to get a direct rail link sanctioned earlier from Ms Mamta Banerjee and later from Mr Nitish Kumar. Now the people hope that Mr Naveen Jindal, the newly elected MP, will make efforts to get their demand fulfilled. Though Kaithal has been linked with Kurukshetra and Narwana junctions for the past more than 100 years, in the absence of a direct rail service with Delhi, this historic town remains backward as it does not have direct access to any major town of the region. The people of the area have to go to Kurukshetra or Narwana to board a train for Delhi. The demand for a direct rail link between Kaithal and Delhi was raised in the early sixties as Delhi is the hub of trade activity and businessmen of this area frequently visit Delhi to make purchases. But in the absence of a direct train service, they have to suffer a lot of inconvenience and monetary loss as the journey by road is time consuming and costly. Not only this, the people have to reach Delhi to board trains for different destinations in southern, western, central and eastern parts of the country. As Delhi is the nearest international airport from Kaithal, the people desirous of visiting foreign countries have to go to Delhi by road. The people demand from the Central Government and the Railway Ministry that a direct rail service from Kaithal to Delhi should be started immediately. They want that trains plying on the Kaithal- Kurukshetra and Kaithal- Narwana sections should be extended up to Delhi. 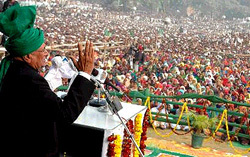 “After rejecting the NDA, the people of the country are now in a mood to reject the UPA also as they are dissatisfied with the UPA government and, therefore, the third front is the need of the hour,’’ Mr Yadav said while talking to reporters after addressing an election rally in Julana in the district. Regarding the statement of the Left parties that there was no need to have a third front at present, Mr Yadav said he would still continue his efforts for the third front. Mr Yadav brushed aside the question whether he was interested to become the Prime Minister after forming the third front. ‘’Not now,’’ he replied with a smile. Earlier addressing the rally, Mr Yadav criticised the Congress by stating that it was creating hiccups in the developmental works of his government in Uttar Pradesh. ‘’But we will continue to run the government in Uttar Pradesh successfully despite the negative role of the Congress there,’’ he added. He praised the late Deputy Prime Minister Devi Lal, stating that the departed leader was one of the leaders who played a key role to form a third front. 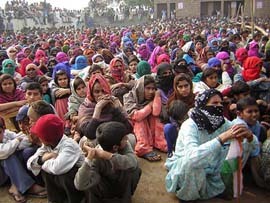 A view of the gathering at a public meeting organised by Prof Chhattarpal in Pabra village, 30 km from Hisar, on Sunday. Thousands of people from these villages assembled at the meeting, which coincided with a meeting of Congress workers of the constituency. People were all over the nearby rooftops, walls and even the tops of their vehicles to hear their leader. Overwhelmed by the reception he got at the rally, the former minister vowed to redress all grievances of the villagers after he came to power. Pabra, where the rally was organised, is Prof Chhattarpal's parental village. Addressing the gathering, Prof Chhattarpal lashed out at Chief Minister Om Prakash Chautala, alleging that he had embezzled money to the tune of Rs 1 lakh crore during his tenure. He said on coming to power, the Congress would institute a probe to expose the property made by the Chautala family through corrupt practices. The Congress leader said he had brought these facts to the notice of the UPA Chairperson and Congress President, Ms Sonia Gandhi. He alleged that Mr Chautala was discriminating against the Ghirai Assembly segment. Most of the speakers maintained that the Chautala regime had unleashed a reign of terror in the state and were promoting "goondaism". They urged the gathering to back Prof Chhattarpal in the coming Assembly poll. Earlier, Prof Chhattarpal was honoured by a number of local residents. He was presented Rs 1,11,000 by the villagers. The president of the Punia khap, Mr Dewan Singh Punia, extended support to Prof Chhattarpal. A number of workers from other parties, including the ruling INLD and the BSP, also extended their support to the Congress leader on the occasion. Talking to this correspondent from New Delhi, working president of the state Congress Randeep Singh Surjewala criticised the Chautala regime for shortsighted policies on education. He said the Chief Minister was ignoring education in his own district. Even after five years in power, the CM had not opened a government college in Sirsa. There was only one Government College in Sirsa with an estimated students’ strength of over 5,000. Students from far-off areas, including Dabwali, Ellnabad and Darba, were dependent on this one college. The youth leader said the Chautala family was only interested in minting money by allowing “private education shops” in the state. He alleged that both sons of the CM had private institutes “managed” by their men. He accused the state government of hiking college and university fee manifold, rendering education beyond the reach of the common man. Citing an example, he said the project named after Mr Chautala’s father, Ch Devi Lal University, was a non-starter even after more than a year. The university was being run without a regular VC. The leaders of the District Congress Committee (urban) and the Block Congress Committee, Ambala, have decided to send their resignations to the party high command if the ticket from the Ambala City constituency was allotted to any outsider. The party high command is reportedly considering the name of Mr Vinod Sharma, a former MLA from Punjab and resident of Chandigarh, for the Ambala City seat. An emergency meeting of the DCC and the Block Congress Committee was convened in the Congress Bhavan at Ambala City this noon. In which the office-bearers of the Mahila Congress, the Congress Sewa Dal, the Youth Congress the NSUI also participated. All local leaders opposed the prospective outsider candidate. The meeting unanimously passed two resolutions stating that the party high command should offer ticket to some local Congress leader and it should be given to an active member of the party. Besides, DCC president Kiran Bala Jain, president of the District Mahila Congress Amarjit Kaur Sodhi, former DCC president Balwant Gupta, senior leader of the Congress Sewa Dal Raj Kumar Gama, president of the District Youth Congress Tarun Chug, senior leader of the Youth Congress Chetan Chauhan and several other Congress leaders, including Arun Garg, Narnder Pali, Hari Shashan, Madan Lal Aggarwal, Malkit Singh, Madan Mohan Ghel, Dharm Pal Kalia, Devender Bajaj, Vikram Tanwar and Nirmala Sandhu were present at the meeting. The meeting decided to send a copy of the resolution to Congress President Sonia Gandhi, in charge of the Haryana Congress Janardhan Diwedi and some other senior Congress leaders. The Chief Electoral Officer of Haryana, Ms Urvashi Gulati, said the final electoral rolls would be published at each designated locations such as offices of the Deputy Commissioners, sub divisional officers (civil), electoral registration officers, Patwarkhanas, block development officer, tehsil offices, municipal committees, polling stations and post offices. These will be available at these locations for seven days. She appealed to all eligible electors to check their names in the final electoral rolls. In case of any error such as missing of names or any wrong entry, they should bring it to the notice of the electoral registration officers concerned by filling the requisite forms. While the central leadership and representatives of the Haryana unit of the Bharatiya Janata Party (BJP) Kisan Morcha are in favour of construction of Sutlej Yamuna Link (SYL) canal at the earliest, its Punjab unit differs from their stand. Talking to The Tribune here yesterday, president of the Punjab unit of BJP Kisan Morcha Surjit Kumar Jayani said Punjab itself had not enough water for sowing. Had Punjab adequate water, he would not have had any objection to providing water to the Haryana farmers. He evaded a direct reply to several questions, including one regarding whether he was in favour or against the construction of the SYL canal. Mr Jayani along with six BJP Kisan Morcha representatives from Punjab were here to Panipat to participate in its two day national executive meeting. According to a report, the investigations were in progress but no arrest has been made so far. Anuj was still undergoing treatment at the local civil hospital after being admitted there by her father Mr Ved Singh Dahiya, a resident of the West Ram Nagar area of this city. Mr Dahiya said his daughter married Jatinder of Nai Basodi village about seven years ago. After sometime Jatinder and other members of his family started harassing her for not bringing sufficient dowry. She was physically abused by them many times. She left her inlaws house and stayed with her parents. 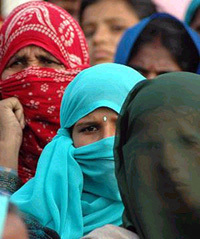 When she returned to her inlaws house they again started harassing her for more dowry. Tormented she again went back to her parents house. But she was sent back after a compromise was reached between both the families. Mr Dahiya said he received a phone call last evening from Nai Basodi informing him that his daughter had been given poison in a bid to kill her by her husband and inlaws. He immediately rushed to the village and found his daughter in the state of unconsciousness. He immediately took her to Sonepat and admitted her to the civil hospital. After gaining consciousness she gave her statement to the police. Thereupon, the police registered the case against her husband and inlaws. Mr Chander Mohan began his tour from Sector 21, where he addressed the first meeting and listened to the problems. The second meeting was held in Group Housing Society 78, Sector 20, and residents listed their complaints like installation of traffic lights at the junctions on the Kalka- Zirakpur highway, improved sewerage facility and imposition of enhancement charges by HUDA. Meetings were also held in Sector 6, wherein industrialists and traders in the town participated. Mr Chander Mohan assured them that once the Congress came to power in Haryana, they would bring in a new era of development and industrial and social growth in the state. In the evening, the councillor from Sector 14, Mr R S Badhran, and a former INLD leader, Mr R.K. Verma, along with nearly 300 supporters joined the Congress. Mr Chander Mohan welcomed the new members in the party and sought their support for the elections. Three persons, including a woman, were killed and six injured seriously when the Tata Sumo in which they were travelling collided with a truck near Dadanpur village on Gurgaon road here today. According to information, the Sumo was going from Gurgaon to Jhajjar and carrying nine persons while the truck, loaded with bricks, was going towards Faruknagar. While the driver of the Sumo, Jai Kishan and two others, including Jagdish and Meena, all residents of Bhiwani district died on the spot, six other occupants received serious injuries and they were admitted to hospitals in Faruknagar and Gurgaon. The police has registered a case against the truck driver who fled from the spot. One person was burnt alive in a fire caused by a heater at Bhandari village, near Matloda, in Panipat district. The deceased has been identified as Satnarayan. According to information, Satnarayan switched on the heater to make his room warm on Saturday. However, fire broke out due to the heater when he was sleeping. His body has been taken to Bhim Sen Sachar hospital for a post-mortem examination. The National Institute of Fine Arts (NIFA), in association with the Bank of Punjab, organised Jhankar-2005, a cultural programme, at Kalidas Rangshala here last night and collected money to donate to the Prime Minister’s Relief Fund for the victims of the tsunami natural disaster. Mr Pritpal Singh Pannusaid more than Rs 20,000 were collected on the spot for the Prime Minister’s Relief Fund. He said, in addition to this, NIFA had decided to contribute Rs 21,000 from its own accounts.